እያንዳንዱ ሥነ ሥርዓት የሚካሄድበት ቀን ከሀገሪቱ ነባራዊ ሁኔታና ከአስገዳጅ ነገሮች አንፃር ሊቀየር እንደሚችል መግለጫው ያመለክታል፡፡ ግብፃውያን ግን በመስከረም 2005 መጨረሻ አካባቢ አዲስ አባት እንደሚያገኙ ተስፋ አድርገዋል፡፡ ኢትዮጵያውያንስ? Thanks Dani .what about We? ግብፃውያን ግን በመስከረም 2005 መጨረሻ አካባቢ አዲስ አባት እንደሚያገኙ ተስፋ አድርገዋል፡፡ ኢትዮጵያውያንስ? Thank you for sharing this timely info. I believe that we will also have a new Patriarc soon. It would be good to share this idea to members of the Holy Synod to draft a clear and detailed selection procedure. I know that you were researching how the transition between Abune Merkorios and Abune Paulos took place. 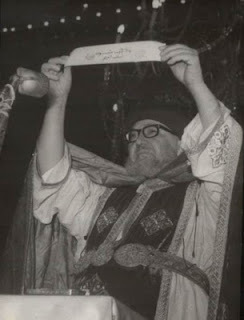 You posted one of the papers written to Abune Merkorios about His retirement and asking him the Monastery where he chooses to stay. Although this is a sensitive issue why didnt you go further in informing us about the transition process during those black days. In a recent Wikleak info, Tamrat Layne informed the US ambassador that he was the one who ordered the removal of Abune Merkorios, and that he feels guilty for the current division in the church and that wants to mediate between the two. ኢትዮጵያውያንስ???? God knows!! !let us all prey to Him about this main issue.let our brothers in Christ, the copts prey for us! can you facilitate that! this is very Good thing if we use it! Betm Yidenk Srat/Hig New. Egnam Yihen Meketel Yigebanal. Thank you Dn. Daniel addressing this basic information to our church. Our Church has very short and full of trouble historical path to get the Holy Patriarch. 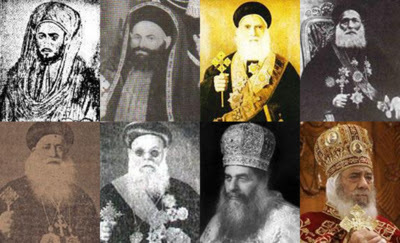 Specially within 21 years, we saw six Patriarchs of the single church. The four from Eritrea ( two passed and two alive) and two from Ethiopia one in exile the other with bloody hand in the Holy palace of Arat kilo. It is fact the church is now completely losing the truck of independent to exercises her rules and regulations in both "countries". I strongly support your idea our church should have this law soon. Otherwise, it will feuling a lot of mess again and drag the church a century back instead of preaching the truth to the world. God and his Holy Virgin St. Marry bless Our Church and you too. by the way have u understand the message and its purpose ?? please write what u know ,why u blem others for what u feel and know?? ?if u can and have the truth tell us ? dani told us what is important for us.i have seen that all important and fit ideas have visited this site not only the idea of the bloger. የቀደሙ አባቶች ምርጫ እንከን የለሽ ነበር ብዬ አልከራከርም። ነገር ግን አቡነ ባስልዮስ፣ አቡነ ቴዎፍሎስ፣ አቡነ ተክለሃይማኖት ከአባ ጳውሎስ ጋር በምንም መመዘኛ አብረው ሊወቀሱ አይገባም፤ ለምን? You deserve the highest appreciation for this magnificent piece. I do hope that all who read your article will think of what we ourselves should do to improve the situation in our church instead of expecting others to do it for us. እንደ አቡነ ተክለሃይማኖት ያሉት ከእግዚአብሔር !!! "belehe sew ke gorebet yemarale "
Due to the sudden death of AP and with the consent of the holy synod it is now agreed to under go the process to elect the new Patriarch. The exact date of election will be announced at the later date but this is just to remind all applicants to be ready with their Sign and submit application till the end of the month.The application should be supported by 500 signatures of the Respective administrative Zone. The Independent MK is not allowed to observe the election process.Others who are legally registered as Mahiber will continue and fully participate in the process.The election process will be fair and free. Me like this comment BETammmmmmmmmmmmmmm !!! menealebate ega maserate yalabenen sanesara karetane yehone???????????????????????????????? እጅግ በጣም የተጠና ውጤቱም አርኪ ነው. . . ታድለው! እኛ ግን . . . እኔ የምለው ለሀገሪቱ ለዋሳ አስተዳደር የቤተክርስቲያን ደካማ አስተዳደር አስተዋፅኦ ይኖረው ይሆን? ወይስ የመንግስት ድካም ነው ያደከማት? ግን ፕትርክና ምን ያህል ጥንቃቄ እንደሚያስፈልገው የግብፅ ቤተክርስቲያን ምሣሌ ስትሆን. . . እኛ ደግሞ የዝርክርክ አሠራር ውጤት ተምሣሌት! Anyway im optimist this crisis period will end, but in z meantime brothers and sisters like dn daniel continue to feed us wiz z proper knowledge. እጅግ በጣም የተጠና ውጤቱም አርኪ ነው! ታድለው! እኛ ግን. . . እኔ የምለው ለሀገሪቱ ለዋሳ አስተዳደር የቤተክርስቲያን ደካማ አስተዳደር አስተዋፅኦ ይኖረው ይሆን? ወይስ የመንግስት ድካም ነው ያደከማት? ግን ፕትርክና ምን ያህል ጥንቃቄ እንደሚያስፈልገው የግብፅ ቤተክርስቲያን ምሣሌ ስትሆን. . . እኛ ደግሞ የዝርክርክ አሠራር ውጤት ተምሣሌት! Im always optimist we will get out of this crisis period. Meantime brothers and sisters like dn daniel plz continue to teach us. . . knowledgable christians will definately make a huge difference finally. Thanks a lot dani. Dani, May God bless you in His abundant Grace and Mercy. If I am not mistaken, the number in the message (which I believe is a great lesson) needs two more zeros.. (በነገራችን ላይ በግብጽ ቤተ ክርስቲያን የካህናት ቁጥር ትንሽ ነው፡፡ እንደኛ 400,000 አድርገን አናስበው)(Instead of 400,000 it is +40,000,000). Please correct me if I did not understand. What are u saing? is all orthodox's are Kahen? kale hiwet yasemaln D/Daniel.Legna abatoch E/Z segawn abzto endih aynetun menfesawi mricha endiyadergu yirdachew. I just have a question for you. I'm not against Abune Shinoda what so ever, but wasn't he a patriarch of Egypt when the Egyptian fathers commit all those crimes against the poor Ethiopian fathers in Israel. Or Der Sultan Gedam? I just thought he should have said something about it or even prevent it from happening.Just saying. Atlanta. Egnam endedirow keza bishomilin endet edilegnoch nebern. Inquan be Gibtsawianu ayinet yikrina kezam banase egiziabher kalgebabet besteker legna yemichal ayimeslim. Dani God bless you...one thing i always want to know..is there a "kenona" as to what color the patriarch should wear...I saw all the previous Ethiopian and Coptic Pops in Black but the guy in the Ethiopian church now is seen in white and late Abuna T/Haimanot in yellow...i think there should be a reason why all the fathers wear black...can you please let us know in one article about these if you can?...thanks! The first and the second patriarch were not politically assumed like Aba Paulos is. Please call a spade a spade. Do not try to mix the problem of our day with that of the true servants of the Church who rested in peace. It is with the coming of Abune Paulos to the patriarchate after toppling down Abune Markorios that our Church has faced such ugly fight over power. And it is TPLF which should be responsible for this, not Emperor Hailesilassie.Instead, His Majesty deserves appreciation and respect for what he did to emancipate EOTC from Coptic Church dominance. As he was the church's protector, the first and the second patriarchs were close to the Emperor. That was absolutely right. However, nowadays, the so called 'government' publicly declared that it was not neither christian nor other religions oriented but secular. If so, it should not have linked itself with the Church's leadership. But the fact is that it appointed its interest protector as patriarch and defends him blatantly. This is the situation that need to be criticized, Dn. Daniel. And also, if we follow our own rules of electing patriarch, it is enough and works well, I believe. Wow. I am happy that someone finally said it.. It is about time..
እድሜ ይስጥህ ዲን ዳንኤል! የእኛ ጉዳይ አሳሳቢ ነው ወይ ፍጹም መንፈሳዊ አልሆንን ወይ የለየለት ሥጋዊ አልሆንን! እንዲያው ለብ ብለን ፈጣሪን እያሳዘንን ነው. ግን ለቤተ ክርስቲያን ጉዳይ መፍትሔ ሊፈልግ የሚገባው ማነው? ምዕመናንስ ቤተ ክርስቲያን የእኔ ናት በቤተ ክርሰቲያን ጉዳይ ድርሻዬን ልወጣ የምንለው መቼ ይሆን? አቤት ሲያስፈራ ወዮልን! ethiopian e/r yasibat kekifum neger yitebikat.